Inducted 1998. Volunteer Wore Variety of Hats While Contributing to Several Teams. Winking admits he “couldn’t make a basket if my life depended on it,” but his tireless and selfless volunteer work for nearly 20 years at Quincy Notre Dame has made him one of the most valuable persons ever to make a contribution to the school’s athletic department. His behind-the-scenes achievements, both with the school’s athletic teams and academic programs, are finally receiving overdue commendation. A 1971 graduate of Catholic Boys, Winking’s volunteer work for QND athletics began in 1980 when he was a ticket taker. He has since held many volunteer positions for many sports. He operated the game clock and scoreboard for the football team from 1982-92, and operated the game clock and scoreboard for the boys basketball teams from 1982-1996. He also filled in as the game clock operator for boys soccer games. He has videotaped boys basketball games since 1984, and he videotaped boys soccer games in 1985 and 1986. He has been the scorekeeper for the girls volleyball program since 1987, has coached the QND volleyball team in summer leagues since 1986 and even drove the junior varsity cheerleaders to basketball games for two years. Winking has been a Booster Club member since 1986 and served as the Booster Club’s treasurer from 1990-92. He then served as the Booster Club’s president for the 1992-93 and 1993-94 school years, and also served as the Booster Club’s representative on the Athletic Committee from 1992-97. 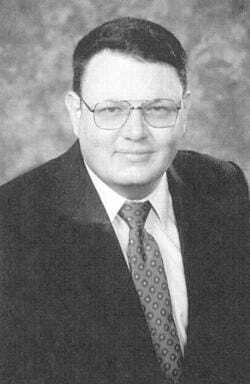 He was president of the Athletic Committee from 1996-97. Winking is an accounting clerk at Knapheide Manufacturing, where he has been employed for 25 years.